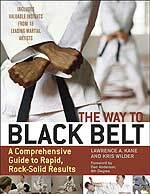 The authors, Kris Wilder and Lawrence Kane, tell the reader in the book’s Introduction they tried to create a book that included everything they would have wanted to know and ask when they were beginning their martial arts journey. They have done just that. The book is broken down into eight general subject topics: Self limitations, finding a good instructor, knowing how you learn, understanding strength versus skill, daily practice, understanding strategy to master tactics, working with injuries, and use of technology. The organization is interesting. The reader is presented a textual collage of voices starting with an introduction written by a martial arts veteran, plus relevant quotes, discussion, student perspectives and personal histories. Also included are action plans, comments on what to look out for, chapter summaries plus additional educational material, history and insights – a lot to absorb. It is as if the reader were sitting around talking with a group of senior students who advise him or her, talk about a wide range of subjects and give their different perspectives. This collective experience produces a sort of group mentoring that makes the student’s personal journey less lonely – he has heard how others proceeded along the same path ahead of him. One chapter that I found particularly interesting focused on understanding the strategy of the art studied. In a comprehensive way it analyzed how reactions in self-defense situations are simplified if the student is first well grounded in the strategy of the art, rather than particular tactics. The psychological foundation of this observation is discussed along with a method of decision making. This is then related to the strategies of different arts, such as the striking and grappling arts. The linkage between strategy and training and the relation between “Do” and “Jitsu” arts are also discussed. If there is any fault in this work, it is that it is so detailed and inclusive that there is almost too much to digest. But then again, this is the type of work that a student can come back to, read and re-read and use as a reference. This book is thus much more than a simple guide to prospective black belt students. It is also a reference, a work chock full of history, explanations, insights, personal experience, psychological insights, reference material backed by suggesting reading, relevant websites and reference material. While this book targets students who are studying to achieve their black belt, it at the same time illuminates a path far beyond this limited goal. But its discussion of strategy and tactics, the physiological and practical elements of combat and martial history make it a book of interest to martial artists on any level.